Basecamp condominium is a HomeAway and VRBO Premier Partner for Mount Snow and the Deerfield Valley in Vermont. We have been in business for two years and have 22 reviews from previous guests. So far we are 22 for 22 with sweeping 5 star reviews. We appreciate the kind comments and look forward to more. The Premier Partner program recognizes owners and managers who consistently deliver great traveler experiences. Super convenient townhouse 5 minutes away from Mount Snow.. Randy & Amy were very helpful and their home is fantastic for two families to share. Wish we could have stayed longer! Would definitely stay here again! Layout accommodated two families very well. Kitchen was very well stocked. Owners were extremely easy to work with. Wonderful stay at what looks to be a newly renovated condo – everything so well thought out and available – made the stay perfect. Thank you for a great vacation! This is a wonderfully layed out and updated home to rent within minutes of Mt Snow. Very close to excellent restaurants and small shops. Thank you to the owners for the warm welcome and we will be back! Basecamp was just as advertised and more–the owners did a great job renovating the space, making it fresh with contemporary design all of the accessories needed for a terrific apres-ski experience. We truly enjoyed the lovely space and the attention to detail paid by the owners at every step of the process, from booking to departure. Our family of 9 had a wonderful stay at your lovely Vermont condo. The entire unit had a very homey feel with everything you needed to feel comfortable and cook meals (lots of blankets, wine glasses, platters etc) All bedding and mattresses were in excellent shape. It took less than 10 minutes to both lodges and some in our group even came back for lunch. We are also now Netflix addicted and look forward to our return. Our group of seven enjoyed every minute of our stay! Quick ride to Mount Snow! Large living room for game nights after fun ski/snowboard day. We all voted yes to coming back and staying there again! Highly recommend! The owners were very communicative and nice. They had the fireplace all set up to just light when we got there, which was such a treat since it was 10 degrees out and snowing when we arrived! The kitchen was incredibly well stocked for cooking. Very kid friendly. Really cute details in design and theme around the whole place. Our two young sons loved the foosball table and teepee. we had a family ski weekend to celebrate a significant birthday for my wife. we had 8 adults and a 4 month old baby. the accommodations were perfect. spacious , modern, clean, and very well appointed. The kitchen was up to date and the dining room table was large enough to seat us all in style and comfort. 5 minutes to Mt snow. Our hosts left us a welcome basket of Vermonts finest and they were very helpful for ideas to help us celebrate. They were very responsive to any question or issues that came up. The weekend could not have gone better! We stayed over part of February vacation- 4 adults and 6 kids! The kids loved the bunk room with the unexpected Nintendo Switch! The loft was great but we had to put adults up there to sleep due to the noise. We had more than enough space for all 10 on the couch to watch movies after a day of skiing. Mt. Snow is only 5 minutes away which was really convenient. For a group that rents lots of homes and eats in… this was the most well equipped kitchen we have ever stayed in. Lovely place… thank you. This was our second time staying at Basecamp and we still love it. it’s well kept and the recent updates are great. very close to mount snow too. We had a great time! The 11 inches of snow certainly didn’t hurt. Everything was just as described and beautiful! Thanks so much. We hope to come back soon! The condo was warm, clean, comfortable and inviting. It had everything we needed to make our family vacation absolutely perfect. We had a wonderful time in VT.
Basecamp’s “Rustic Modern” description is perfect for this tastefully renovated condo. We’ve stayed at several different property’s in the Mt Snow area over the past several years and would put Basecamp at the top of the list. We were impressed with the set up upon walking in the door and continued to be impressed as we settled in to all three levels within the unit. Fully equipped with modern amenities and Vermont charm, Basecamp delivered as advertised. Fantastic job and thanks for sharing! Our family absolutely LOVED this rental property. If you are a fan of Fixer Upper on HGTV, you will think Joanna Gaines decorated this herself! The homeowners have taken excellent care of this property by making improvements to all rooms. Our family of 4 stayed here with another family of 5 and not once did the children complain that they were bored. With activities in the loft, Wii games in the bunk bed room to the fireside family games made available for guests, they were entertained the entire stay. In fact, my own son asked if we could live there! This was beyond our expectations. We found it warm, welcoming and immaculate. 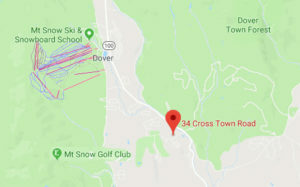 We highly recommend this rental property for your future travels to the Dover area. We had a great time at this family friendly, completely renovated condo. The condo was minutes from Mount Snow, which was very convenient to this large mountain. The accommodations were clean and comfortable. There were three bedrooms, plus a loft/playroom with an additional bed in the loft. There was a large dining room table that sat our two families. The kitchen was well stocked with plenty of pots and pans to make dinner. There were plenty of bath towels and paper goods as well. We would definitely recommend this end unit condo to our friends. Had a great time staying at this property. Unit is beautifuly decorated, very spacious and looks like it was recently fully renovated. We had 7 adults and 2 children and there was plenty of room for everyone. Kitchen is a nice size and very functional. The unit has all the little things you need as well as a nicely stocked cupboard with items like coffee, sugar, creamer, etc. Refrigirator is stocked with condiments, like ketchup and butter. Living room is large with a nice TV and fireplace. The night we arrived the fire place was all set up with wood and kindling just needing a match to get it going. Loft has nice foosball table we used almost every night. Unit is less than 10 minutes to Mount Snow and a great place to stay for a family ski trip. We had an amazing time. It’s 3.5 miles from Mount Snow, and a 25-minute drive to Stratton Mountain. There is a 7-eleven, Gas station, a few Ski rental shops, and restaurants within walking distance. The property is truly exceptional! There are 3 levels including 3 bedrooms, a nice bathroom with jet tub, and laundry room on the ground floor. The next level up is a spacious and beautifully designed family room with high ceilings a fireplace, leads into a dining room area with large table and chairs which continues to the kitchen and open deck with a large barbecue grill. Going up a level a separate area with a 4th bed, fooseball table and play area. The design is modern with a rustic feel, very warm and cozy. The owners are exemplary – you can tell that they have put much effort into every little detail, equipping the place with anything you may need to make your stay comfortable (from kitchen appliances to entertainment/reading material for adults and children. Great experience! Highly recommend! We had a great time at the condo. It’s a perfect location for Mt Snow and there really isn’t anything bad I can say about it. We loved the place and there is lots of space for everyone. Our kids loved it too and had a great time with the bunk beds and the games in the loft. We were so sad when it was time to leave! what a terrific place to stay. highly recommended – many thanks to the owners! Thanks taking the time review our property. We are glad to hear that you enjoyed your stay! Beautiful fall foliage, wonderful time! We had a great time staying at basecamp. It’s close to everything in Deerfield Valley and the property is spacious and beautifully designed. Very modern with a rustic feel. he kids loved the bunk room. A true vacation property. We will be back for ski season!